Should we bring back cinema intermissions? How much is a dog’s life worth? The Financial Conduct Authority has come under fire this week from MPs worried it is letting down the consumers on whose behalf it is supposed to regulate the country's banks and investment firms. The BBC’s Andy Verity reports. There has been a string of bad news stories about the way certain charities conduct themselves recently - from financial mismanagement at Kids Company, to the relationship that Age UK has with energy company EON. Speaking live in the studio is Harriet Sergeant, research fellow for the Centre for Policy Studies. A report for the Government on achieving greater efficiency in England's hospitals says there are wide variations between trusts in costs for surgical procedures and staff sickness levels. Christina McAnea is director of Health at Unison. Proposals for how the UK courts could uphold British sovereignty over the application of EU laws are expected be brought forward "in the coming weeks", Downing Street has indicated. Sir Francis Jacobs is former advocate general at the European Court of Justice and president of the Centre for European Law at Kings College London. Renee Fleming is an opera superstar who has won four Grammys as well as performing for Barack Obama and the Queen. But after 25 years at the top, the soprano has decided to stop appearing in opera on stage and focus on new work and concert appearances. Arts correspondent Rebecca Jones reports. There has been a string of bad news stories about the way certain charities conduct themselves recently - from financial mismanagement at Kids Company, to the relationship that Age UK has with energy company EON. Speaking live on the programme is Michelle Roberts, director of Investigations, Monitoring and Enforcement at the Charity Commission. Justin Webb’s recent pet mishap - his dog ate his socks - and subsequently expensive veterinary bills have got us thinking - when are vets' bills simply too much? Contributing live in the studio is Justin Webb, Evan Davis and his dog Mr Whippy. A report for the Government on achieving greater efficiency in England's hospitals says there are wide variations between trusts in costs for surgical procedures and staff sickness levels. Speaking on the programme is Lord Carter, Labour peer and report author. A Times poll today suggests that Britain could vote to leave the European Union. Nick Robinson went to meet the voters who could take us down the road marked ‘exit’. Is it time we saw the renaissance of the intermission in cinemas? Quentin Tarantino’s The Hateful Eight- at three hours and seven minutes - is being shown with an interval. Kate Muir is chief film critic at The Times and Quentin Letts is The Daily Mail’s theatre critic. The Financial Conduct Authority has come under fire this week from MPs worried it is letting down the consumers on whose behalf it is supposed to regulate the country's banks and investment firms. Martyn Hopper is partner at Linklaters law firm, advising financial institutions on regulatory matters. Scientists at the John Innes Centre have made a new discovery that could provide a way to prevent bacterial infections without triggering drug resistance in the bacteria. Dr Jacob Malone is project leader of molecular microbiology at the John Innes Centre. The new England rugby union manager Eddie Jones wants to bring back the Red Rose 'arrogance' as he takes the team into the Six Nations this weekend. We hear from former England rugby player Lewis Moody and former Scotland player Kenny Logan. Ethiopia is amid its worst drought in decades with more than 10 million people needing emergency aid. As the BBC’s Alastair Leithead has found out, despite the government stepping in to provide for its people in the drought-affected east of the country, Ethiopia still needs international help. 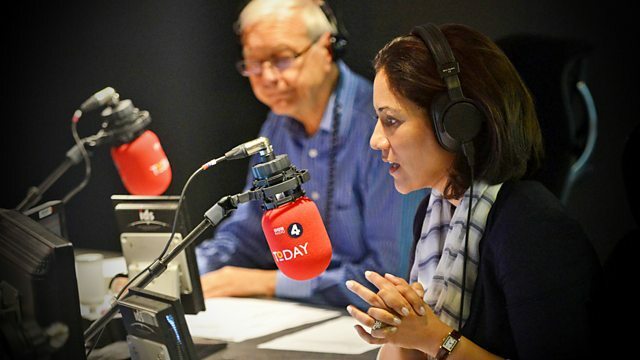 Earlier in the programme, we heard Nick Robinson’s report explaining why certain groups are likely to vote a certain way in the forthcoming referendum on British membership of the European Union. But what about those people who remain unconvinced either way? Tom Newton-Dunn is political editor for The Sun and Catherine Mcleod is a political commentator and former special advisor to Alistair Darling.